I mentioned last week that we were in the process of doing a total guest bathroom remodel project. 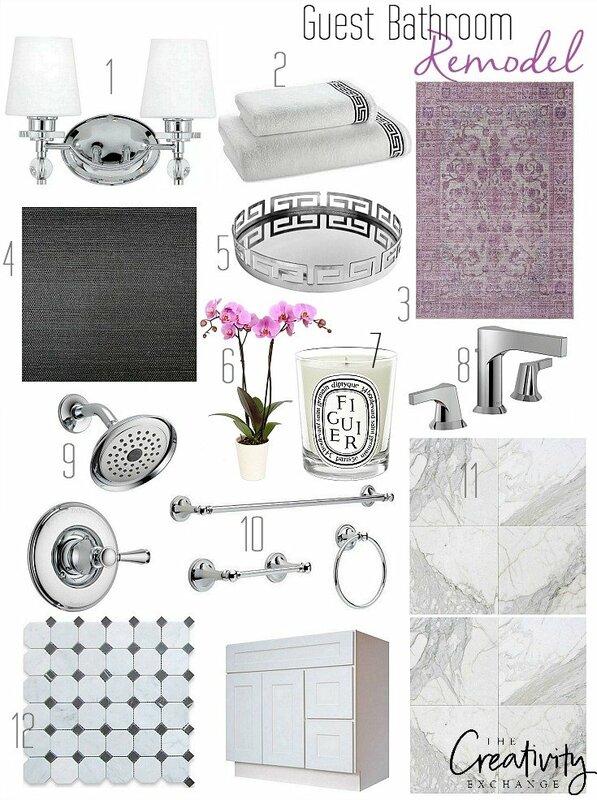 If you missed that post and my “dream bathroom” inspiration board, you can find it here. 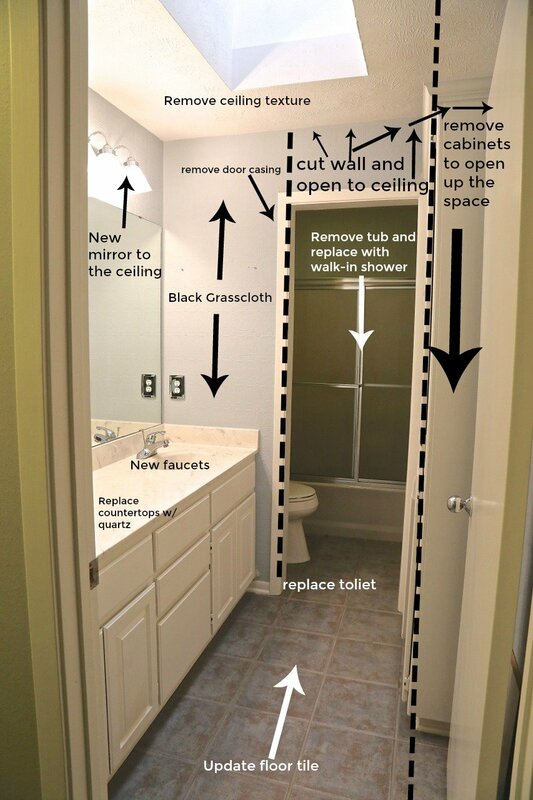 Today, I wanted to share our final bathroom remodel plan and sources, along with more details for our project. I’m also sharing some of our “before” shots and tell you about our progress so far. 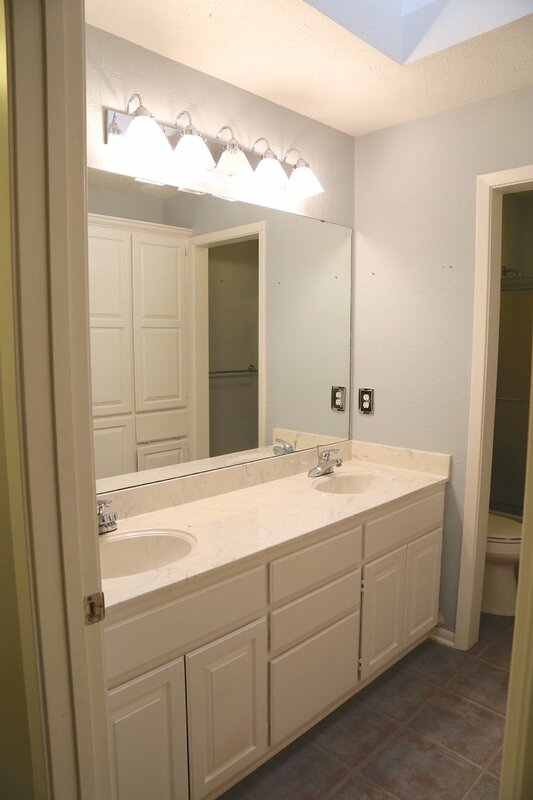 ****Update*** Our bathroom remodel is finished and can be seen here. Initially, we were all set to begin the remodel our master bathroom first. 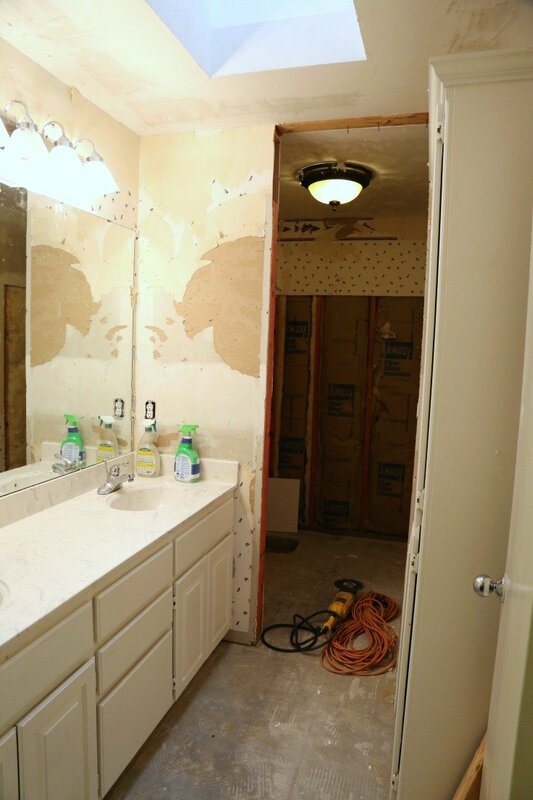 However, our (dated) master bath is very large (over 200 square feet) and our remodel plan will require walls and plumbing moved, which you know what that means… It will be a very expensive and time consuming project. Our home is over 30 years old. Last minute, we decided to remodel our much smaller guest bathroom first as a practice run before we start the master bath remodel. Since both projects were at the top of our project list for this year, it made more sense to start small first. 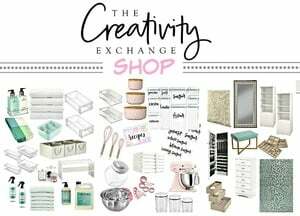 We felt like we could better understand ways that we may be able to save money, what materials/products we needed to spurge/cut corners on and better grasp all the planning/little stuff. 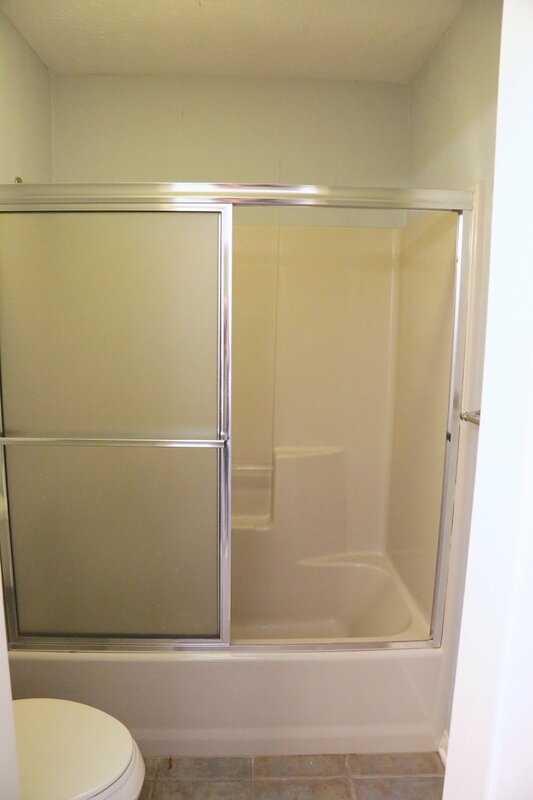 I can’t wait to pull out this shower tub combination and replace with a beautiful walk-in shower. 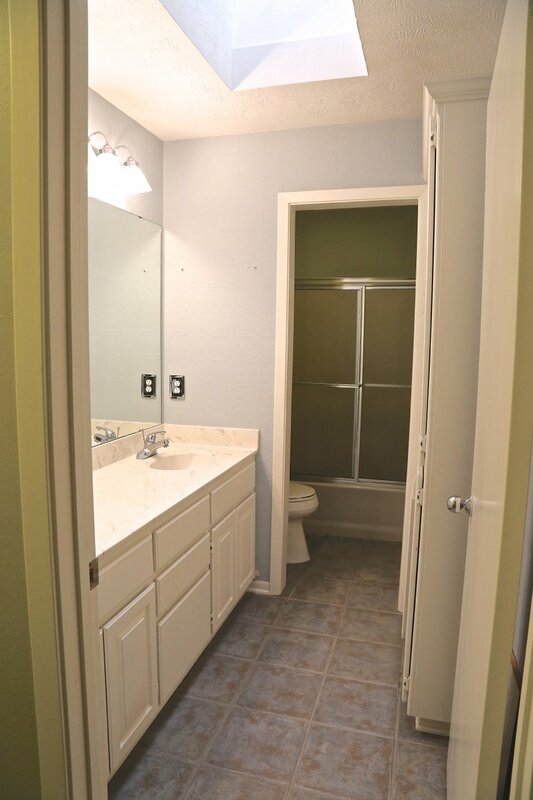 So as you can see, it’s a pretty small guest bathroom, very narrow and dated. We’re so excited to update it. So the plan is to gut everything in this space. Everything is going except the vanity cabinetry, which will get a facelift. My goal for the remodel is to update the space and make the space larger. As you can see above, we’re going to really open up the space by removing the floor to ceiling cabinets (on the right) that are 12″ in depth. The cabinets are really are the crux of this space because they are to big for this space and it makes it hard to move around. The great news is that these cabinets fit perfectly in our laundry room, so we’ll just be relocating them and our linen closet will now be in the laundry room. The other big problem with this space is the door frame/overhead wall that was built. Why they didn’t just leave it open, so the space would look more open and larger is beyond me. However, that’s just what they did in the 80’s. We’re taking out the wall to the ceiling above the door frame. 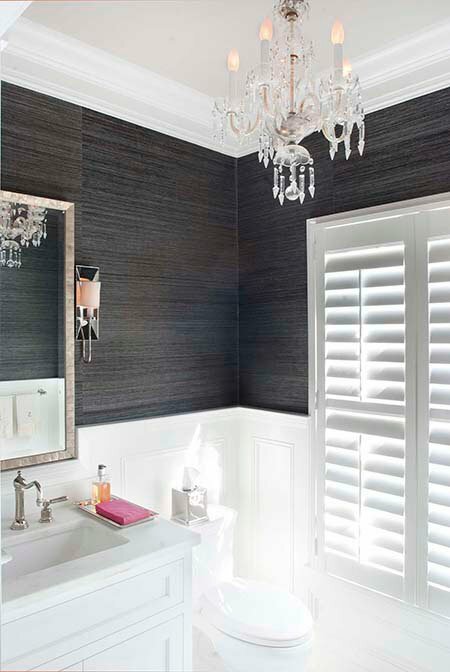 I have had a love affair with black grasscloth for many years and knew that I would incorporate it into my bathroom remodel somehow. Also, I am incorporating this exact mosaic marble hexagon floor below. I love black mixed with the white, marble and shiny chrome. So we have come up with our final plan and here are all the products sources we are using for the remodel. So far, the demolition has been done and all the tile has been laid. Here’s a sneak peek at our progress so far! 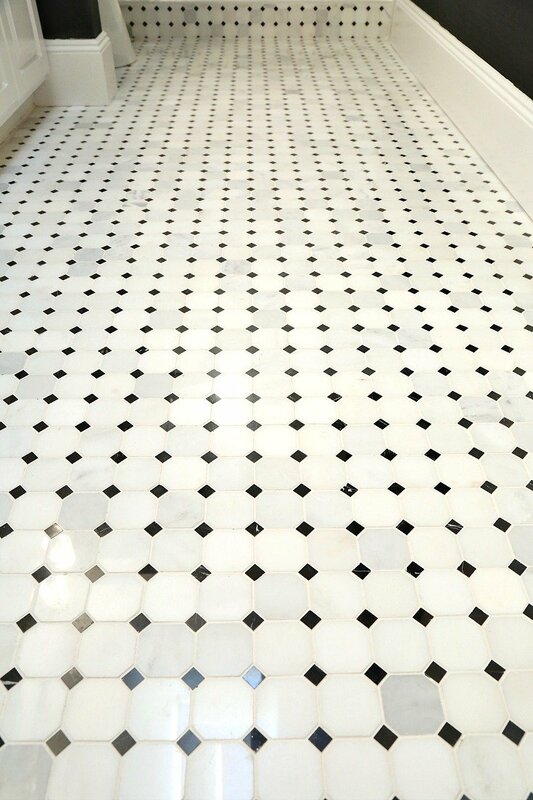 The marble mosaic hexagon tile has been laid and we LOVE it! The Cambria quartz countertops were installed and we have started to hang the black grasscloth. 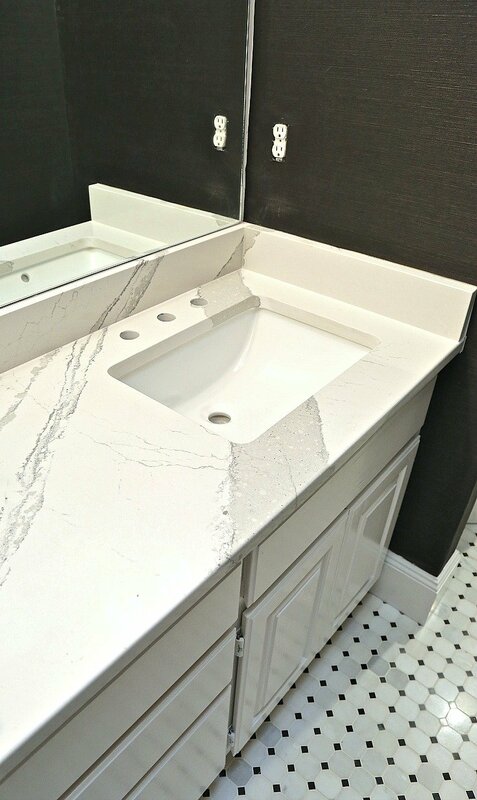 I learned so much about countertops throughout this process and after researching, we settled on the Cambria quartz in Britannica for durability and beauty. 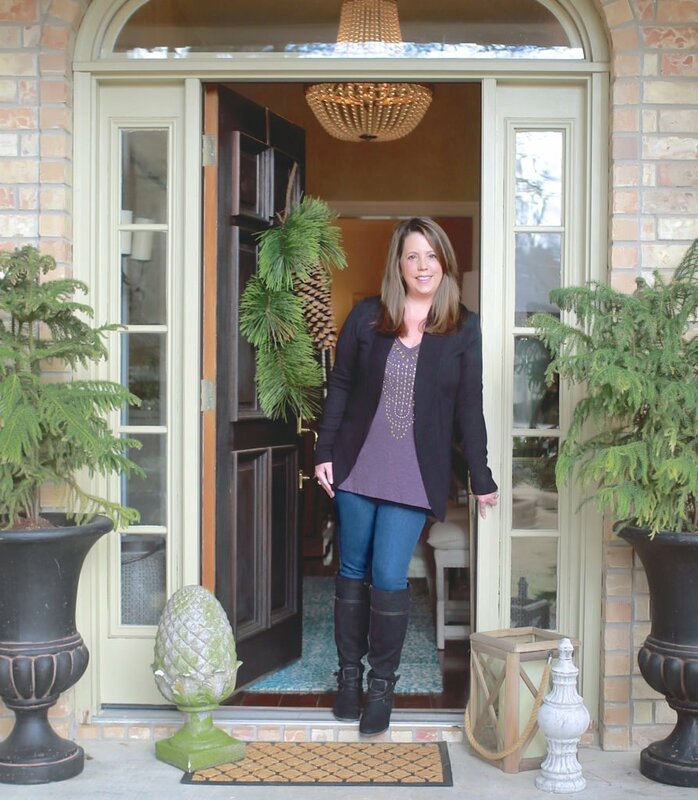 Now we’re on to finishing all the small details and it’s been such a great learning experience as we begin finalizing our master bathroom remodel. Our plan is to be finished in guest bath in the next two weeks. I’ll be sharing all the details when were finished. I can’t wait to get this bathroom done and share it with you guys! This looks fantastic! 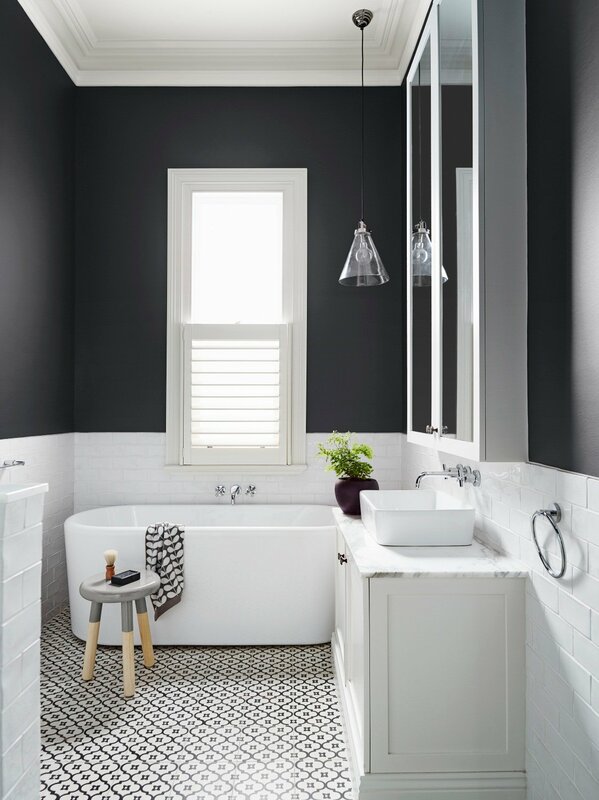 I would love to redo our guest bath, which looks eerily similar to yours–double vanity made of that cultured marble-looking substance, tub/shower insert and a door between the vanity and shower/toilet that just gets in the way. I can’t wait to see the final reveal! This is going to be sooo amazing! Cant wait to see the final results. It looks beautiful, so far. 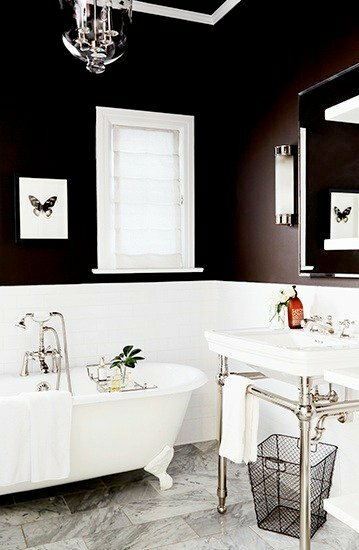 I am eager to watch, as I have almost the same bathroom, but with 70’s avocado fixtures that I will be remodeling soon. I came across your site. I can’t wait to see the final reveal! !